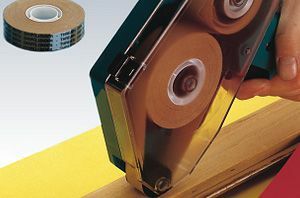 Double-sided tape , transfer the tape, which was very thin backing, reinforced with fiberglass, combined with a modified acrylic adhesive gives it a very good adhesive qualities. The tape is secured with a protective veneer paper in brown. Excellent for fixing images, combining fabrics, bonding adhesive labels to the hard surface, is also used in bookbinding. 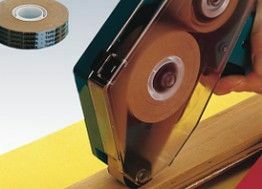 The tape is wound on a plastic core, and the use of special dispensers facilitates its application.